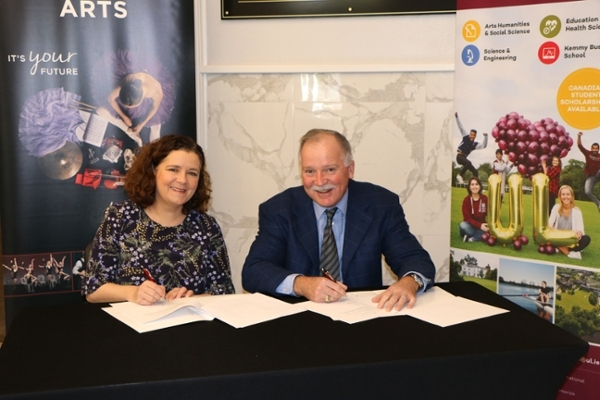 Holland College’s School of Performing Arts has signed an agreement with the University of Limerick to allow graduates of SoPA’s two-year Theatre Performance, Dance Performance, and Music Performance programs to enter the second year of the University of Limerick’s Bachelor of Arts in Performing Arts programs. “Agreements such as these ensure that Holland College graduates can pursue their educational and career aspirations in a seamless, cost-effective manner. Further, on this very Irish island, where a third of Prince Edward Islanders claim Irish roots, we have retained our Irishness in many ways, including through our traditional music. That foundation is very important to us as we build our Performing Arts programs, and this partnership with the University of Limerick can be a cornerstone to that effort,” said Michael O’Grady, vice president of Innovation, Enterprise and Strategic Development at Holland College. The Holland College School of Performing Arts is a partnership with Confederation Centre of the Arts. For information about SoPA programs and degree pathways, visit www.hollandcollege.com/sopa. For information about the University of Limerick and scholarships for Canadian students, visit www.ul.ie.